Combine flour, 2 tablespoons sugar, baking powder and salt in a small bowl. In a medium-sized pot, add water and butter, and bring to a boil until the butter has completely melted. Remove from heat. Quickly add flour mixture with a wooden spoon until it forms a ball. Add vanilla and eggs, one at a time, and combine until the dough is soft. Add the batter to a piping bag with a large star-shaped tip. Heat the vegetable oil on medium-high in a deep frying pan. Pipe the churros directly into the oil so they are about 6 inches long and straight. Fry 4-6 churros at a time until they are completely golden. Remove from oil and place on a plate lined with paper towels to remove excess oil. Repeat the process until you have used the remaining batter. Use a wooden skewer to make a hole on the inside of each churro. Use a piping bag with a long round tip to fill the churros with dulce de leche or Mexican cajeta. Combine sugar and cinnamon and roll the churros in this mixture. Save time by using frozen churros. Churros are a classic dessert that can be enjoyed all year long. Crunchy on the outside and soft on the inside, they can’t get any better. Or can they? 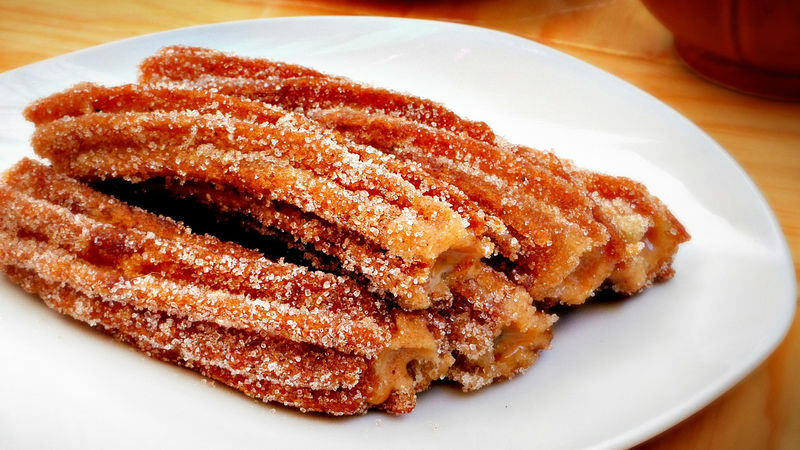 By adding a delicious dulce de leche filling and coating them with sugar and cinnamon, you’ll have the best churro ever.